DANA POINT — Capt. Dave Anderson and his catamaran, Lily, have taken “whale watching” to a new level. Instead of just watching whales, the founder of Capt. Dave’s Whale and Dolphin Safari/Orange County’s Dolphin Safari Whale Rescue, has become involved in rescuing whales that become entangled in nets — and he has created a boat designed to help rescue them. Anderson, a Lakewood local who has been in the whale watching business for 20 years, bought the power catamaran nine months ago. Then, he transformed it into a whale rescue and research vessel — equipped with two cameras, a 13-foot inflatable tender, signal beacons, grappling gear, specialty knives and poles for cutting whale-entangling nets, and a hydrophone attached to the stern that can pick up five levels of dolphin and whale sounds. With a water-maker that can produce 24 gallons per hour, two power generators, two stoves, an industrial-size freezer, three sleeping areas, showers, heads and a research facility, Lily is built to be able to spend long days (and nights) at sea. Sometimes, it may take two days to complete a whale disentanglement. Lily has signal beacons, which can be attached to buoys that Anderson’s rescue team will secure to grapple lines clasped to a whale’s entanglement. These tracking devices allow the team to release their hold of the grapple line while maintaining a lock on the location of the whale. Should they lose sight of a whale, as whales often dive from fear or frustration during a disentanglement, the tracker will guide them to back to the whale — and, with a bright flag attached to the buoy, to the beacon. Anderson hasn’t always been this prepared for such situations. In 2006, Anderson was out on the water when he saw a humpback whale trapped in netting near Dana Point Harbor. Fastening a knife to a pole, he tried to cut the netting to free the whale. But because he was unprepared, untrained and without the necessary equipment, he was unable to help the animal. The ocean guide said he was unable to find an Orange County whale rescue organization he could turn to for help. That’s when Anderson contacted the National Oceanic and Atmospheric Administration (NOAA), to request that he be trained in whale disentanglement. “At first, the NOAA was kind of reluctant to do the training. But then, a whale appeared trapped the next year — and the organization decided it was a valuable move,” he said. NOAA representatives taught Anderson several key skills to helping entangled whales, such as the “Nantucket sleigh ride” — a maneuver that involves cruising up behind the animal, catching the netting attached to the whale with a hand-thrown grappling hook, and remaining in tow of it. Once trained, Anderson established a whale rescue organization, Orange County’s Dolphin Safari Whale Rescue. His first post-training rescue attempt occurred in 2008, when he found a blue whale with gill-net wrapped around her tail flutes and mouth, cutting deep into her skin. Unfortunately, “by the time we got to her, it was really too late to help,” Anderson said. After freeing the whale, he named her “Lily.” She died several days later. Though gone, Lily has remained an inspiration for Anderson, becoming the title of a novel he wrote, and the name of his catamaran. 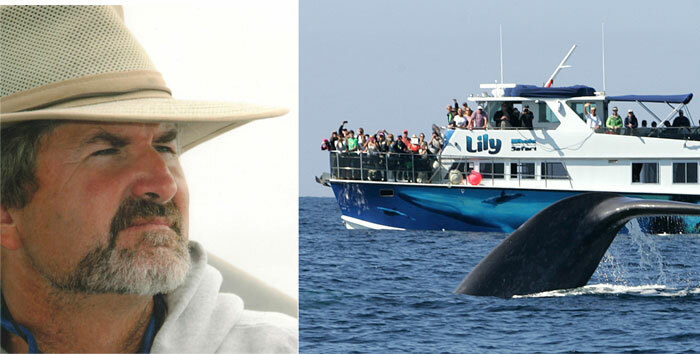 Now, passengers can help in his passion by documenting whales on one of Anderson’s special whale rescue safaris. Aboard Lily any Saturday at 9:30 a.m., passengers use a camera mounted to the bow and take moving shots of whales and dolphins. They can also use an underwater camera, mounted on a remote-operated vehicle (ROV) on the ocean floor, to get shots of other sea life and explore the depths of the ocean off Dana Point. “Whoever gets the best picture each day gets theirs put in our catalog, as well as (getting it) sent to Cascadia Research Collective to aid their studies,” Anderson said. “If it’s a new animal we haven’t shot yet, their name gets put in the catalog, as well.” While Lily is built for disentangling whales, for safety concerns, Anderson won’t do so with passengers on board. “The most we’ll do is observe — which is a very important part of helping,” he said. “When someone spots an entangled animal, it’s crucial to keep track of it and follow it until a trained individual can come,” Anderson explained. But Anderson also warned against boaters helping any further. “Never get in the water with them,” he said. For more information, visit dolphinsafari.com.